Congratulations to our winners, Alexis and Zhivko! 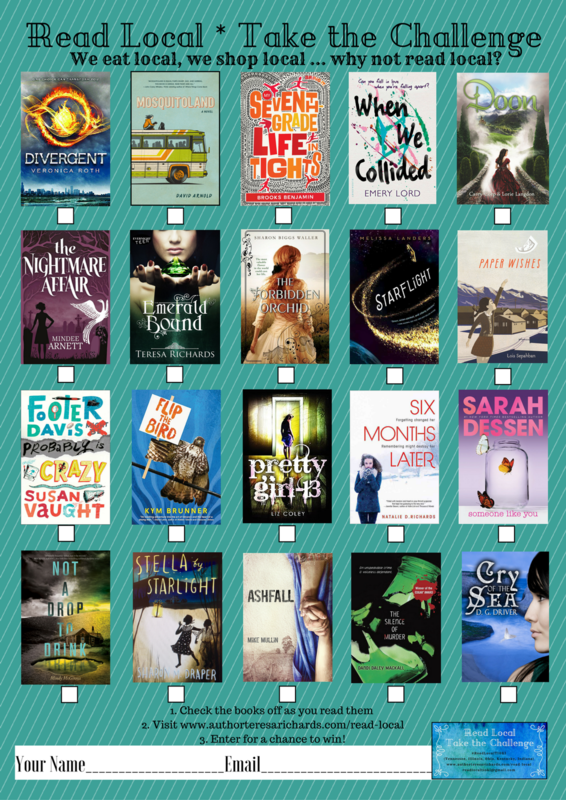 The contest is now over, but feel free to keep reading and discover your next favorite book! To be notified of future Read Local contests, Join my Fan Clan . With permission from author Lori Goldstein, we are piggy-backing on her Read Local Campaign for New England and creating a Read Local Campaign for the Kentucky region. Authors are from Tennessee, Illinois, Ohio, Kentucky and Indiana, but the contest is open to everyone! The challenge is to see who can read the most books on the list before each of the prize draw dates. Contest runs the length of the 2016-2017 school year. Winners will be announced one week after the draw date, at the top of this page. Before each draw date, fill out the form below telling us how many of the books you've read, and enter for a chance to win a $25 iTunes or movie theater gift card! 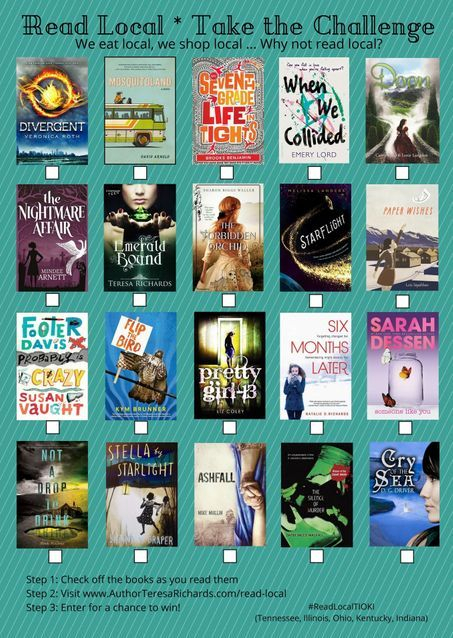 If you're a teacher (or librarian with a YA-loving book group) your class can work together to read the books, then enter the combined number of books read for a chance to win an author visit for your classroom. Entries are cumulative, but if you read more books between draw dates, make sure to fill out a new form with your updated total of books read. The winner will be the person who's read the most books. In the event of a tie, the winner will be chosen randomly from the pool of submissions with the highest number of books read. For a printable version of the Read Local TIOKI flyer, go here, or click on the flyer image above. Did you read all twenty books on the list? If 'No', how many books did you read from the list? If you win, which prize would you prefer? Out of all the characters, from all the books, who was your favorite and why? Name one cool thing you learned, from any of the books you read. Would you like to be added to author Teresa Richards' mailing list and recieve emails about future contests, giveaways, and book releases? Thanks for entering! Winners will be notified by email and announced on this website. Follow #ReadLocalTIOKI on Twitter for live updates. Your class can work together on the challenge, then enter to win an author visit from Teresa Richards (Kentucky), Mindy McGinnis (Ohio) or Sharon Biggs-Waller (Indiana). Note: In-person visits are our favorite, but a Skype visit may be necessary if the driving distance is too great. Drawings will be held on December 1, February 1, and May 1st. Did your class read all twenty books on the list? If 'No', how many books did your class read? Which state is your school in? Is there anything in particular that you'd like your author visit to focus on? Thanks for entering! Winners will be notified by email. In the event the winner is unreachable within two weeks of the drawing, another winner will be chosen. "I cannot say enough about how inspiring and motivational it was to have Teresa Richards speak to our students about writing. Her tips on "Save the Cat" and the "Ticking Time Bomb" could be used by writers of every age!" "My class was so lucky to have Teresa Richards visit! She did a wonderful job engaging the students and getting them excited about the writing process. They were all very excited to learn from her and hear about her book, Emerald Bound. I would highly recommend this author visit to other teachers!" "Mrs. Richards visited our second grade classroom and was an absolute hit! The students LOVED hearing about how books were written and all the steps it took to get one published. We LOVED hearing how she compared the writing to baking and decorating a cake. The students were hanging on her every word and the excitement they had for writing after her visit was contagious. They were wanting to write all the time and discussed their writing using the cake to aide in their discussions. Having her able to come and talk with our class was such a wonderful experience. I know that I will remember this visit for a long time and I know that the students will be using this visit to develop their writing for years to come! I am so fortunate to have had the pleasure of hearing her speak and discuss writing with my students!" Drawing for an author visit from Brooks Benjamin will be held on May 1, 2017. Did your class read all twenty books?